Tea of the Month Club, join other tea lovers to enjoy the finest and freshest gourmet tea from around the world. A perfect gift that theyll remember long after the holidays are over. With each Tea of the Month Club shipment youll receive three different 100g (3.53oz) bags of our gourmet fresh tea, mailed every 3 months. First month shipment will be mailed within 2 days from order date. Each recipient will receive a letter announcing your gift, brewing guide and tasting note. Along with the first month shipment, well send your recipient a free gift. 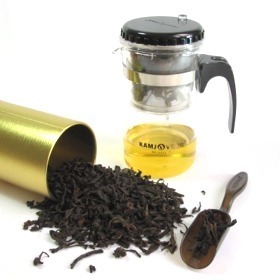 With any tea of the month club order, well send one of our 200ml (5 oz.) smart teapot (a $18.00 value). The smart teapot is the easiest devices for brewing loose tea. Hurry up, join our Tea of the Month Club today! The best gift I have ever given! The recipients rave about the tea every time I visit! I was a little disappointed with this item, it was a birthday gift for my aunt and the description says it will come with a letter announcing your gift and it didnt so my aunt had no idea what it was, who it was from and how often she would receive it!